I love the Assassin’s Creed Games. And the latest to hit the shelves at the end of this month is looking mighty nifty in it’s own right. Set in the American Revolutionary war this game has flintlock rifles, Naval battles and Cannons aplenty. Richard Ryan, the host of Rated RR blow stuff up so we don’t have to! To give you a real feel for just how devastating the cannons and flintlock rifles would be he demolishes a “Hot Rod” Saturn, and blows the hell out of some pumpkins. I figure yesterday we had a little Pumpkin Gun Art today should be no different. So in this awesome video we have. 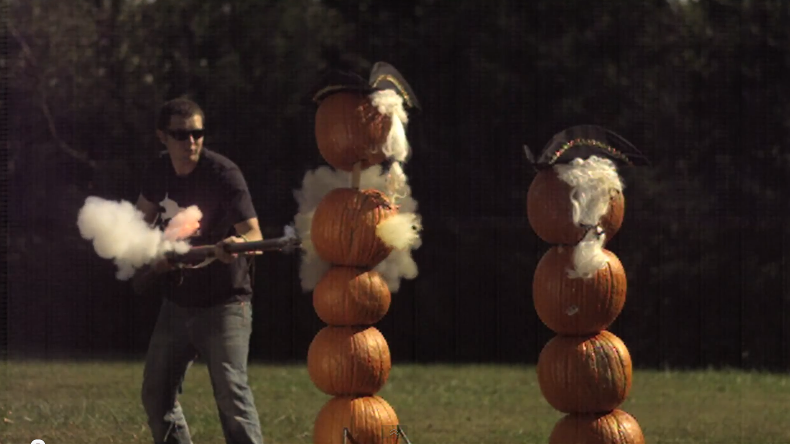 Cannon vs Car, Pumpkin vs Gun. And Just drop dead gorgeous photography. via Cannon vs Car in Slow Motion: The Breakdown — Assassin’s Creed III RatedRR – YouTube.